I'm prepping for a big show this weekend and there are endless tiny details that need to be addressed. One not so tiny detail was a certain set piece that three guys need to sit on that has to resemble a log. 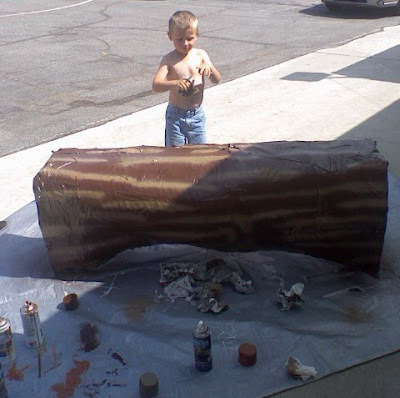 We've been using a bench covered in burlap for rehearsal, but the director really wanted a log. Last night we added a little chicken wire and paper mache to the bench. I felt like I was back in high school drama all over again! Today our sound tech, Brian, was kind enough to do the first pass of painting it to look less like a bench covered in chicken wire and paper mache and more like a log in the middle of the forest. Brian was also kind enough to let Benjamin help. Which means Ben got covered in spray paint. I made him take off his shirt before he started! Brian gave him a rag dipped in turpentine to clean his hands off, which also served the dual purpose of clearing his stuffy sinuses. He just got a nice warm bath to get rid of the last residue of paint and chemicals and now we are both going to take a nap. The log looks great! Can't wait to see it on the set!